A copy of a driver's license as well as the execution of the downloaded rental agreement and registration form from my community are all required to complete rental. 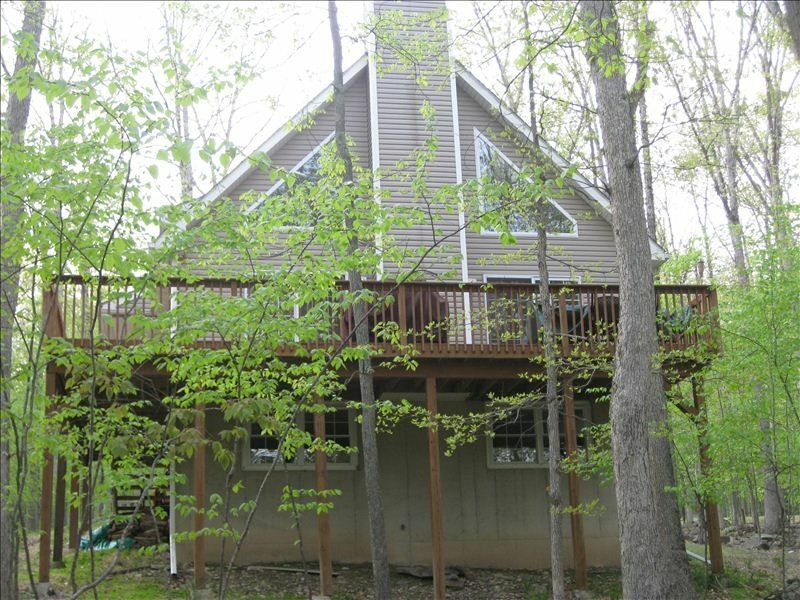 Enjoy all this Northern Pocono community has to offer while staying at this luxury Masthope Mountain 4BR Chalet. You are guaranteed to see a deer in your own backyard. Masthope Community is an all-year round community with a 250 acre spring fed lake for swimming, boating, water-skiing, and fishing. The community boasts an olympic size swimming pool with water slides and a kiddie pool area. You can also enjoy tennis, basketball, handball, bocce ball, horseshoes, shuffleboard and more. Masthope has hiking trails and horseback riding. In the winter, you can ski at Masthope's own Ski Big Bear area with 18 trails, five lifts, with skiing, snow boarding and tubing. Home is less than 5 minutes from ski mountain. Main living room features cathedral ceilings with floor to ceiling windows that lead out onto a wrap-around deck with patio seating. House features central A/C, ceiling fans and internet service. Main living room features a 55 in. LCD tv with blue ray disc player. 3 of the 4 bedrooms have LCD tv's on wall, cable and dvd players. Bedroom 1 features Queen size bed and a full size dresser and closet. Bedroom 2 features a Queen size bed and a twin size bed and small dresser and closet. Bedroom 3 features a Queens size bed and a twin size bed and full size dresser and closet. Bedroom 4 features a King size bed and a full dresser and closet. A wood burning fireplace will keep you cozy in the winter in the main living room. The full kitchen features a breakfast bar and is fully equipped with dishes, pots, cutlery, glasses, coffee maker, crock pot, toaster, hand mixer, blender, chopper, baking pans, bowls, containers and more. The dining room seats 8. Finished basement has gas fireplace, 55' LCD TV, Music docking station, brand new washer/dryer, leather couch, games (pool tables, air hockey and a ping pong table coming shortly). Basement has a full bathroom with stand up shower and sink. There is also a laundry room with washer and dryer. Home is 5 minutes from skiing and 10 minutes from lake. THERE IS A 3 NIGHT MINIMUM FOR ALL HOLIDAY WEEKENDS - January: Martin Luther King Weekend - February: Presidents Weekend - May: Memorial Day Weekend - July: Fourth of July - September: Labor Day Weekend - December: Christmas (both weekends surrounding Christmas) - New Years Weekend. Keywords: chalet, ski, lake, river, pool acess, game room, lodge, Big Bear Ski Resort, playground, park, tennis, basketball, shuffle ball, horseback riding, trails, hiking, fitness center, central air, washer/dryer, ceiling fans, dvd players, LCD tv's, cable, 2 fireplaces, internet access, golf, Woodloch Pines. We are a family of 3 who use the house as our second home when it is not rented. We would like all renters to treat the home as they would as if it was their own. We do not rent to groups, proms, graduation parties or any parties. Rental age is 25 and over. This is a wonderful year-round community with an array of amenities and things to do in the area. WE GIVE A DISCOUNT FOR A WEEKLY STAY. ADDITIONAL DISCOUNTS OFFERED FOR 3, 4, 5 & 6 NIGHT STAYS. PLEASE REACH OUT AND I WILL LET YOU KNOW WHAT THEY ARE AND CUSTOMIZE YOUR QUOTE. VRBO WEBSITE DOES NOT OFFER THESE FURTHER DISCOUNTS. We are 5 minutes from skiing, snowboarding, cross country skiing and tubing in the winter and 10 minutes from the lake/beach/pool/rafting in the summer. WE GIVE A DISCOUNT FOR A WEEKLY STAY. ADDITIONAL DISCOUNTS OFFERED FOR 3, 4, 5 & 6 NIGHT STAYS. PLEASE REACH OUT AND I WILL LET YOU KNOW WHAT THEY ARE AND CUSTOMIZE YOUR QUOTE. VRBO WEBSITE DOES NOT OFFER THESE FURTHER DISCOUNTS. You will be charged for any calls that appear on phone bill that are not local. Central Air. Renter is responsible to turn OFF the air conditioner upon check out otherwise a $25.00 fee will be assessed. Baseboard heating. Renter is responsible to turn BOTH thermostats down to 50 degrees (1st Floor and basement) upon check out otherwise a $25.00 fee will be assessed. Wood burning fireplace in living room. Please bring your own wood. BRAND NEW Outdoor firepit with adirondeck chairs. Pots, plates, glasses, coffee mugs, bowls, flat trays, slow cooker, chopper, mixer, blender, utensils. Don't forget to bring extra plastic garbage bags, paper towels, toilet paper. (4) LCD tv's in 3 bedrooms - all with dvd players. Main Living room has 55' LCD tv with Blue Ray dvd. Basement has 55' LCD tv and a music entertainment system. Patio set. Seating for 6. Additional plastic seats available too. Ski at Big Bear Mountain 1 mile away. Less than a 5 minute drive. There is a community pool 1 mile away. Open in summer only. Short distance to Hawley - Honesdale & Lake Wallenpaupack. 5 minutes from Woodloch Pines Resort. 15 minutes from Kittatiny for zip lining, water rafting, kayaking, tubing etc. WE GIVE A DISCOUNT FOR A WEEKLY STAY. ADDITIONAL DISCOUNTS OFFERED FOR 3, 4, 5 & 6 NIGHT STAYS. PLEASE REACH OUT AND I WILL LET YOU KNOW WHAT THEY ARE AND CUSTOMIZE YOUR QUOTE. VRBO WEBSITE DOES NOT OFFER THESE FURTHER DISCOUNTS. Love this home, very well keep, super clean, spacious and has everything you would need. The town is gorgeous and a lot to do in the area. We went to the beach, lake, pool and river during this 3 days. The kids loved the deer's and the horses that pass by from the trail. We enjoyed every single place of this home. The kids love the basement with the pool and ping pong table, the big TV. I will definitely to this beautiful home. There's a lot to do in Lackawaxen Pool, beach, lake, river, horse back riding you name it. The owner very friendly and responds quickly to any of your questions. THANK YOU so much for letting us build such beautify memories at your amazing home. HIGHLY RECOMMENDED!! We thoroughly enjoyed our stay at Masthope. Our rental home was truly wonderful, we felt so comfortable we did not want to leave. The community is really nice, the lake and pool were lots of fun. In addition, there are a ton of other things to do like eagle watching, paddle boarding, horseback riding, shuffleboard etc. Gina and Scott keep all you need in the house in order for you to feel at home, and the house is very clean and tidy. We loved our week, and loved our stay in your wonderful home. This rental was everything the description on VBRO promised it would be. The home was immaculate, and had everything we needed. Our family of 6 fit very comfortably., and our teens enjoyed the pool table and ping pong table. The owner was prompt in responding to our questions, and even took time to check in with us during our stay to be sure we had everything we needed. The Masthope community has a lot of amenities, and it is all included with the rental. Our family enjoyed kayaking and paddle boarding at the lake, and we enjoyed relaxing by the pool. We would definitely rent this home again, and would recommend it to our friends and family. The house is beautiful and the pictures on line really do not due it justice! Plenty of rooms for 12 people with room to spare. Will absolutely return again! I came to the property with a group of graduate students and we had an amazing time! The cabin is spacious, comfortable, clean, and had everything we needed! There were plenty of bed and fun games in the basement. The community itself has a lake and pool that guest can access with passes, but a maximum of 12 passes are given to the household, and 4 of those passes must be reserved in advance (just a note to work that out with the owners ahead of time!). The owners were easy to communicate with and very responsive via email. I would love to stay here again, I highly recommend it! We had the best time during our New Year's stay! Gina is so wonderful and helpful!! House is absolutely beautiful and had everything we needed!